These unique modular benches are designed to connect with their matching planters which act as end supports on either side of the bench. Constructed of maintenance-free, 100% recycled plastic 2" x 2" and 2" x 4" bullnose slats. Benches are not designed to stand on their own. Planters and benches are sold separately. 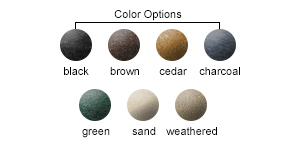 Available in the recycled plastic color options as shown below.